The Supreme Court in it its first day of the new 2017 term hears opening arguments over companies that require employees to sign away their right to sue them over employment issues and force them into arbitration instead. Epic was one of three companies whose attorneys argued their positions Monday. Liberal justices expressed concern that allowing such agreements rolls back employee rights by decades and discourages expensive individual employee lawsuits, while the court’s conservative members opined that mandatory arbitration clauses are legal and that employees can as a group hire the same attorney to reduce litigation cost. The Obama White House had initially asked the Court to hear the case in support of the NLRA, but the new administration now sides with the employers as represented in the proceedings by its Deputy Solicitor General. The main issue is whether arbitration agreements are legal under the Nation Labor Relations Act, which gives employees the right to take collection action. The attorney representing the companies argues that the NLRA guarantees the right of employees to have a forum convened, but once that has happened, employers can present defenses that include previously signed arbitration agreements, an argument to which one justice took exception in interpreting NLRA as covering all workplace issues. A decision in favor of the employees would invalidate the employment agreements of up to 60 million Americans. Two courts have ruled that Epic’s arbitration clauses are illegal, while another ruled that they are legal. The court will render its decision later in the term. The survey response rate was 23 percent, with 280 respondents representing 66 facilities. I don’t know how many hospitals are running Paragon to know if that’s a significant percentage of sites. Black Book wisely focused on hospital decision-makers rather than end users. 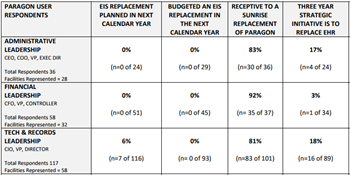 The survey found that none of the respondents have developed new plans to replace Paragon, although that’s not surprising since the acquisition was announced only a few weeks ago. The report says that 96 percent of boards are “confidently optimistic” (I would have expected “cautiously optimistic”) that Allscripts will do a better job than McKesson, which might not be a high bar to clear. There’s also the question of how knowledgeable board members would be on IT topics. Two-thirds of the hospitals say they don’t have the money to replace Paragon in the next two years and will instead focus on revenue cycle management, population health management, and analytics. That’s probably the most important finding of the survey. Eight-one percent of IT leaders representing 58 facilities say they are receptive to the Allscripts takeover. From Gideon: “Re: Allscripts. Layoffs in the former McKesson’s professional services area on the day the merger was finalized – PMs, tech, and interface resources. The words used in the termination letter were, ‘’Unfortunately, the new organization structure doesn’t include your position.’” Unverified, but reported by several readers. Layoffs by either company are, unfortunately, hardly newsworthy, and certainly an acquiring company will nearly always – immediately or eventually – start trimming costs involving any assumed redundancy to help pay for the acquisition’s cost. From Givenchy: “Re: Athenahealth. Hospitals are retreating. Following the failed implementation at Jackson Medical (AL), about 20 hospitals are cancelling scheduled go-lives. At least three have returned to their previous systems after collection and cash flow issues and clinician dissatisfaction. Veterans Memorial Hospital (Waukon, IA), Kimball Health Services (Kimball, NE), and Appleton Municipal Hospital (Appleton, MN) have returned to CPSI owned-products.” Unverified. From Corny Collins: “Re: NYC H+H. NYC tax dollars hard at work as officials played dress-up with Epic employees at UGM.” I disagree. Their attendance (I’ve blurred their ID since it felt creepy otherwise) is reasonable and taxpayer accountability doesn’t require frostiness with their vendor. 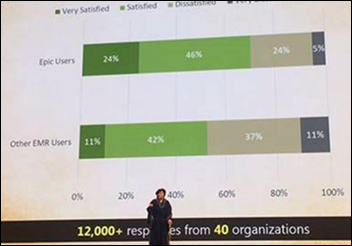 I agree, however, that healthcare people attend a lot of questionable conferences and thereby increase patient costs questionably, although a vendor’s user group meeting when you are spending hundreds of million dollars to implement their product doesn’t spring to mind as an obvious excess. Those of us with health system experience struggle with appeasing valuable employees whose self-worth is defined by running around like a big shot at conferences of questionable ROI, but the employer has to set the parameters and assess the value they receive in return for the cost and out-of-office time. 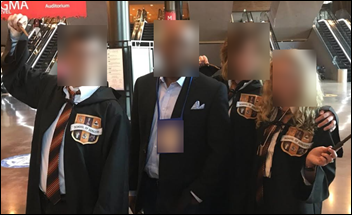 A better target is the HIMSS conference, where people who clearly have no good reason to attend dutifully pack the exhibit hall because they like the attention and networking and can convince their employer to foot the bill. Meanwhile, NYC H+C may need some wizardry as it says it’s down to 18 days of cash on hand. From Journomaniac: “Re: HIStalk. You must have had partnership or acquisition interest that you haven’t mentioned but should in the interest of full disclosure since you criticize other sites.” Three health IT sites (that I recall – maybe there were more over the years that I’ve forgotten — have approached me unsolicited wanting me to partner with them, sell out to them, or go to work for them. All three said they would render HIStalk obsolete because of their superior technology, deeper corporate pockets, or more insightful approach, thus leaving me no choice but to throw in with them. I dismissed their inquiries quickly because I like working alone in a way I can be proud of. All three of those sites have folded up their health IT tents while I’m still here doing what I’ve been doing since 2003. That’s all I have to disclose. I’d rather quit than let someone else tell me what to do. From Abraxas: “Re: VistA. The Indian Health Service uses the VA’s product at no charge. With the VA’s move to Cerner, they haven’t been told whether they will continue to get free access and they have no budget for a replacement EMR. I wonder what will happen to other VistA users once Cerner replaces it in the VA?” I would expect VistA to become an orphan product now that the VA’s attention has been diverted to the Cerner shiny, no-bid object, leaving VistA’s other users without access to the VA’s expensive development. VistA is used by hospitals all over the world as a free public domain product, although some of those are supported by third-party companies like Medsphere and WorldVistA. 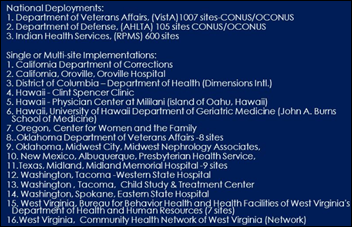 I invite those with more knowledge about VistA than I have to weigh in on its future outside the VA. 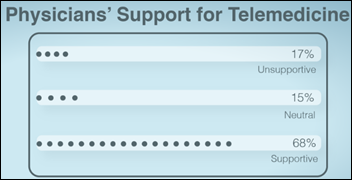 Above is part of a 2015 slide I found from the VistA Software Alliance listing VistA’s users. Welcome to new HIStalk Platinum Sponsor ChartLogic, a division of Medsphere. The Salt Lake City, UT-based company, founded in 1994, offers a complete ambulatory EHR solution (EHR, PM, RCM, ERX, patient portal). 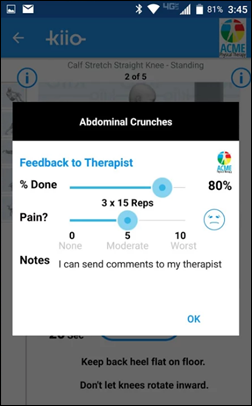 Providers can create a complete patient note in less than 90 seconds, supported by intelligent voice commands, specialty-specific content (vocabularies, templates, flowsheets, and macros) and a single-page layout. Its practice management system includes a preference-based appointment scheduler, eligibility checking, an automated Collection Center, and quick claims entry and one-click payment posting that reduces claims rejections to less than 5 percent. The company’s browser-agnostic patient portal offers appointment scheduling, mobile intake forms, SMS patient reminders, and online payments to improve patient engagement and experience. ChartLogic also offers services for billing, revenue cycle management, and managed IT and service desk. 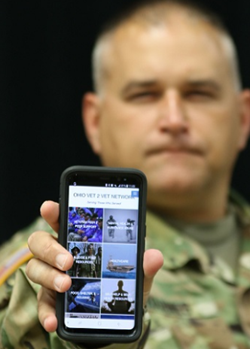 The Department of Defense recognized the company a few weeks ago for its support of the National Guard and Reserve, a program led by ChartLogic EVP and former Army Ranger Chris Langehaug. Thanks to ChartLogic for supporting HIStalk. I found this ChartLogic EHR overview on YouTube. October 17 (Tuesday) noon ET. “Improve Care and Save Clinician Time by Streamlining Specialty Drug Prescribing.” Sponsored by: ZappRx. Presenter: Jeremy Feldman, MD, director, pulmonary hypertension and advanced lung disease program and medical director of research, Arizona Pulmonary Specialists. Clinicians who treat pulmonary arterial hypertension can spend an average of 20 minutes to prescribe a single specialty drug and untold extra hours each month completing prior authorization (PA) paperwork to get patients the medications they need. This webinar will describe how Arizona Pulmonary Specialists automated the inefficient specialty drug ordering process to improve patient care while saving its clinicians time. 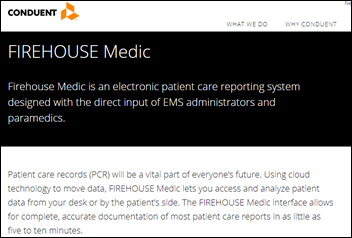 First responder software vendor ESO Solutions acquires the Firehouse emergency management software business of Conduent Government Solutions. Kiio — whose platform screens for low back pain, joint replacement, and rehabilitation and offers exercise guidance — raises $1 million from Wisconsin-based not-for-profit insurer WEA Trust. Olmsted Medical Center (MN) chooses Epic to replace the former McKesson (I think they were on Series, but I’m not positive). 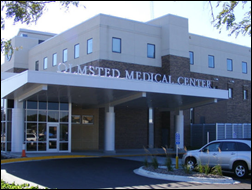 UPDATE: readers say Olmsted was using Cerner CommunityWorks for inpatient, with which it has reached HIMSS EMRAM Stage 6, and McKesson for ambulatory despite undated information I saw mentioning that it was running McKesson Series and McKesson-acquired MED3OOO. Robert Barras (The Advisory Board Company) rejoins CTG as VP of healthcare sales. Seattle Children’s (WA) hires Zafar Chaudry, MD, MSC, MIS, MBA (Cambridge University Hospitals NHS Foundation Trust) as SVP/CIO. Senior living community software vendor Caremerge (Merge Healthcare) hires Nancy Koenig as CEO. She replaces founder Asif Khan, who remains as board chair. Larry Wolf (Strategic Health Network) joins MatrixCare as chief transformation officer. MedeAnalytics hires Tyler Downs (TriZetto) as CTO. Julie Mann (Optum Analytics) joins Holon Solutions as SVP of sales. ViTel Net hires Richard Bakalar, MD (KPMG) as VP/chief strategy officer. 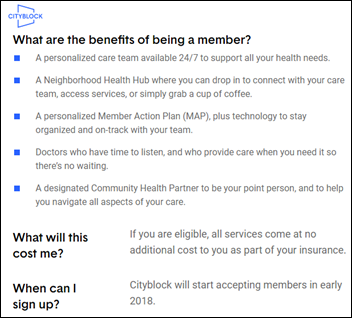 Sidewalk Labs, an urban innovation group within Google parent Alphabet, announces Cityblock, which will offer residents of low-income communities who are covered by Medicare or Medicaid a care team that provides doctors, coaches, technology tools, and a health plan. The service will launch next year. 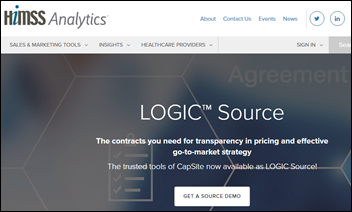 HIMSS Analytics adds the former CapSite vendor contracts database to its Logic platform, renaming it Logic Source. EClinicalWorks adds a self-service option for customers to connect with CommonWell and Carequality. A Black Book survey finds that while hospitals and medical practices are increasing their IT outsourcing and like the prospect of increased efficiency at a lower cost, their satisfaction with outsourcing companies is decreasing. Most of that dissatisfaction involved IT managers who are forced to manage an inexperienced health IT outsourcing vendor. The top-scoring EHR vendors were Cerner, Meditech, and Allscripts. A small Dimensional Insight hospital CIO/CMIO survey concludes that less than half of hospitals have implemented enterprise-wide data governance, causing problems with data integrity and access. Infor launches Cloverleaf Consolidator for data aggregation and exchange in a multi-EHR environment. JAMA will launch a broad-topic, open access journal in early 2018. 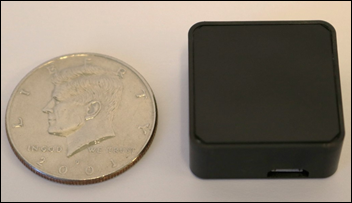 Fujitsu announces a new palm vein biometrics sensor for its PalmSecure F-Pro Suite authentication solution. Elevate the HHS chief information security officer role to be equivalent to its CIO and make that position responsible for creating a cybersecurity plan. Pass the CONNECT act that would remove geographic restrictions for telemedicine. Increase funding for rural healthcare broadband coverage discounts and adopt CDC electronic information flow for case reporting, lab reporting, disease surveillance, and death reporting. A home care provider in Australia launches a “holographic doctor” in which physicians can participate in a home nurse consultation via mixed reality technology that uses Microsoft HoloLens. Both doctor and patient wear a virtual reality headset that allows them to see each other in real time along with the patient’s healthcare data. A Health Affairs article finds that hospital interoperability didn’t improve much from 2014 to 2015 as less than 20 percent of them reporting that they “often” use outside patient information to make clinical decisions. 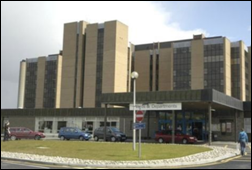 A hospital in Scotland cancels surgeries after going back to paper following flooding of its basement data center. Ohio National Guard Captain Michael Barnes develops a veteran suicide prevention program as part of his coursework at The Ohio State University to attain a master’s degree in nursing. Employees of The Chartis Group held a community service event at its annual retreat in New Orleans, supporting Boys Town, Covenant House, Raintree, Salvation Army, and YMCA. A Spok case study describes the use of Care Connect by Union Hospital of Cecil County (MD) to reduce communication breakdown. Casenet will exhibit at the Change Healthcare Inspire Conference in Philadelphia this week. Ability Network is named a finalist in the Tekne Awards that recognizes technology innovation in Minnesota. AdvancedMD will exhibit at the American Society for Dermatologic Surgery October 5-8 in Chicago. Aprima will exhibit at the American Osteopathic Association Conference & Exhibition October 7-9 in Philadelphia. Besler Consulting will exhibit at AHIMA October 7-11 in Los Angeles. Carevive and Crossings Healthcare Solutions will exhibit at the Cerner Health Conference October 9-12 in Kansas City, MO. CoverMyMeds will exhibit at the American Association of Medical Assistants Annual Conference October 6-9 in Cincinnati. The Nashville Business Journal includes Cumberland Consulting Group on its Fast 50 list for the third consecutive year. quote of the day: “I’d rather quit than let someone else tell me what to do.” well said. especially if they are a self serving moron. Re: The Allscripts survey of 66 facilities and 280 responses. Statistics can be massaged to suggest just about anything. You have to dig into the actual data. That’s an average of 4 people per facility replying. What positions replied and are those positions “significant” decision makers in the organization. (ie was it the CNO, CEO, COO, CMIO). Now those roles and replies really make a survey significant. Wonder who Black Box surveys? “I like to keep my eyes open as I’m about to die.” – CPSI Evident RN presenting at the NRHA conference. Oddly prophetic based on their current marketing tactics. Your poster raising the questions around the Black Book study is likely onto something. Those that work in this corner of the industry have long been aware of the general coziness between Black Book and Allscripts. Policies or no, it’s a very close relationship.